The canopy weights secure easily to the canopy leg with velcro attachment for greater security for outdoor canopy use. Reinforced with durable 500 denier polyester fabric, the universal canopy tent weights holdsup to 25 lbs. of rock, sand, or dirt and may be used on all surfaces.Four weight bags are included in a set, one for each canopy leg. I just acquired 4 weight bags. When I looked at them it, it appears that the bags have 2 separate sections and tops do not close. Is that correct? The weight bags do have two separate sections to fill with stand. They can be closed by folding the top back until the velcro sections meet for full enclosure. I have very little topsoil (1-2") before hitting limestone rock. How do you secure the canopy in these conditions? If you do not have enough soil to stake your tent, then the weight bags are recommended. They provide up to an additional 80 lbs of support. What are the physical dimensions of these bags, ie diameter height? Will they hold water? The dimensions are 16-1/2" wide and 21-1/4" high. The diameter, when around the canopy leg, would depend on the material in it and how much material you have in it. This will not hold water. Each universal weight bag holds up to 20 lbs. of rock, sand, or dirt. Can you tell me the dimensions of these bags? The individual bags measure 16.5" wide by 21.25" high. The diameter when attached around the canopy leg would depend on the material in it and how much material you have in it. Do they come with sand or do I need to fill them with fillings? Each bag will need to be filled with 20 lbs. of rock, sand or dirt and this will not arrive with the weight bags. Is there a video or written instruction on exactly these (Premium Weight Bags) are to be installed/affixed to the canopy legs? No such instructions exist, but the operation is very simple. These bags are empty as we ship them, and you would add rocks, sand, or some other solid material to weigh them down. They feature industrial velcro straps which loop around the bottom of the legs of your canopy. Do I hang the canopy weight bags from the top of the tent or from the circle hook at the bottom of the tent that lifts to adjust the leg height or should I wrap these canopy premium weight bags around the feet of my canopy? Thank you for your inquiry. You would need to wrap the weight bags around the feet of the canopy legs. How do I attach these Canopy Premium Weight Bags to a tent pole? The bag attaches with Velcro straps connected to the weight bag. Does these Canopy Premium Weight Bags hold water rather than sand or stone? These can not hold water. 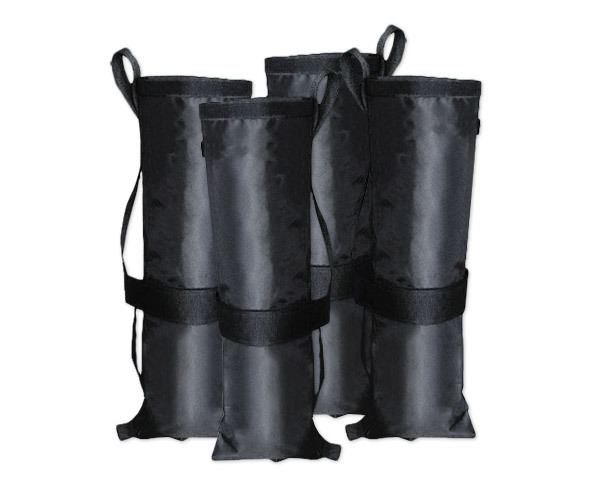 Weight bags that are capable of holding water are the Set of Four Undercover Gravity Tubes with Quick Straps. When using these Caravan Canopy weight bags, do I have to use the stakes that go into the ground as well? It isn't necessary to stake down the canopy if you're using weight bags. If you have the space to use the rope and stakes it is added protection. As we are at a craft festival and the tents are right next to each other the ropes and stakes are Not an option but the weight bags are perfect. I hope this helps answer your question. Both are great together, but it just depends on how much space you have. Good question by the way. No. You can use the weight bags when your ecanopy is set up on concrete as well as on grass. Simply tightly wrap the strap attached to one side of the weight bag around the metal leg of the ecanopy and attach the Velcro end of the strap to the other side of the weight bag. Using the stakes gives you added security to make sure that your canopy does not move. Also, some place you can't even use stakes and the weight bags are ideal for securing your canopy. I use the weight bags instead of the stakes. There are so many places that do not allow stakes, or the venue is on concrete, so the option is using weight bags instead. How much weight at each corner is needed for this? It sounds like 20 lbs at each corner would be enough to hold the canopy down. Is this true? I would think that it would need more like 40 to 60lbs per pole to be the same as the stake kit. Can you please advise? For most applications, the 20 pounds of ballast offered by each weight bag will be enough to anchor the tent properly. If you anticipate higher wind gusts, you may want to go with the Set of Four Undercover Gravity Tubes with Quick Straps, as they can offer even more ballast. Do I attach the weight bags to the inside or the outside of the canopy legs? It does not matter which side you attach them to. Will these work with 1 5/8" diameter pipe? Yes. They will work with that diameter. What are the dimensions of this product? Length and width in inches? it is 16-1/2" wide and 21-1/4 high. The diameter when around the canopy leg would depend on the material in it and how much material you have in it. These weight bags are very rugged and well made. Very easy to fill and attaches to the canopy legs in a flash with Velcro. I am very impressed. They are well worth the investment! These look like they will be helpful during light to moderate wind events. I will still use stakes and guide lines. Excellent product! Easy to pack and much easier to carry than a 5 gallon bucket weighted with concrete! High quality materials, attachment points are also sturdy and very well thought out; all in all, I consider these bags not only a necessity for the larger canopies, but also a steal at the 4-bag package. They have a very small footprint and are not unsightly, the overall impression is very professional. ProsStore flat, very sturdy, good attachment points, excellent quality material. We used these weight bags with our Caravan Display Shade 10'x10'. These weights were easy to use, filled with pea gravel, and added the extra precaution against heavy winds at this year's Rolex (RK3DE) event in Lexington, KY. We also used our canopy for the 1st time and were very pleased how quickly it setup at our site. We really appreciate being able to store the canopy top assembled to the frame, which simplifies setup. We needed extra security from high winds and weighted with bricks before, these are doing the job. I thought I could just use 5 gallon jugs to anchor my canopy to meet show requirements. I bought the Weight Bags because of the good price and found that they LOOK GOOD too. During four years we have been using various weights for our canopy but none of them worked out to be a long term solution. We ordered a set of four Premium Weight Bags and are very pleased with the strength of the bags material and the ease of installing them on to the legs of the canopy. I put pea gravel in heavy duty zip lock bags and put the bags into the weight bags...they are working very well partially because the weight bags have a strap to lift and move them plus a Velcro strap to secure the weight bags to the canopy leg. Canopy weights do what they're designed to do and that's to hold the legs of the canopy down during high winds. Easy to use and works well to hold canopy in place. Looks much better than big buckets we were using before! This canopy is a cut above the rest with aesthetics and construction quality! Very happy we went with this company. I had a vendor show coming up in a week and after purchasing a canopy, I could not find weights to hold it down. I found this company on the internet and took a chance on ordering the weights that I needed. I was so surprised they arrived before my show. Quality is great, filling was easy, and with the handles easy to move around for placing on the legs and storage. These are SUPER easy to use and my canopy hasn't moved! We live in a very breezy spot and these are amazing. Highly recommend. Easy to fill and to attach to canopy legs. Durable fabric. Holds just the right amount of weight to help keep canopy stable without being too heavy to transport. I recently ordered and received the weights for my tent. They are now filled with sand and ready to go to my next show. What a great and handy idea. I'm very happy with my purchase. Makes the canopy very steady! Very easy to fill; we used pea gravel. I like the tote strap and the velcro for attaching to the canopy leg. Needs better closure, lost some gravel out of one when it tipped over. Easy to use and do a great job holding tent down on a windy day. They are easy to fill and transport. The handles make it easy to transport them. These weight bags are perfect. The tent is regularly set up at a farmers market that seems to exist in a wind tunnel. These weight bags are easy to fill (ours are filled with small rocks), set up, and carry. Our market requires 25lbs of weight per leg - with the river rocks we used to fill our bags, we just about filled all four bags with 120lbs of rock total. Perfect! The bags work well in adding weight to the legs to prevent it from blowing away. ProsEasy to fill with sand. Provide adequate weight on each leg to prevent the tent from blowing away. ConsAttachment system could use two velcro straps instead of a single. Also difficult to use with the side curtains. ProsVery easy to take on and off the legs, and they appear to be very well made. ConsIt would be nice if the pockets for the sand were lined with something, or had a bottle type container with a cap. You have to just fill the empty space with loose sand, and while it Velcro closes quite well, there is going to be some dust and leakage. It worked very well with sand and easy to store afterwards. These bags fill easily and the velcro on the top is strong and keeps the bag shut. The weights (which I filled with $2 of small pebbles from Home Depot) kept my tent from moving in high winds. ConsThese weights make it harder to keep the side walls of your tent fastened. In the highest winds, I tucked the sidewall into the weight to secure it better. I haven't actually used the leg weights yet because we're blessed with beautiful weather so much in our area. But I'm sure they'll do their job when the time comes. You do need to supply your own sand or other filler to actually make them heavy; they arrive as empty bags designed to wrap the legs of the canopy. Theses weights are attractive, compact, and east to use. The are not a trip hazard. ConsFilled weight may be insufficient to prevent flight in our high wind area when using the sidewalls. So I supplement by adding PVC torpedo tubes hung from each corner. ehhh... that is supposed to be the sound you make when you are kind of ambivalent about a product. With sand these are not going to put enough weight on a leg to keep the tent safely on the ground in even a mild breeze. We filled PVC pipe with concrete, put a cap on it and inserted those into each of the pockets of the weight bags. That created a weight of about 30 lbs per leg. but you can zip tie those to a leg without the weight bags. Bags just make it easier and neater. These were easy to fill with sand. The handles on the sides make them easy to tote. They look great! The bags are well made and good quality, the problem is the sand stays in place with one velcro strap with no liner bag to tie off. It would also be nice if it had a tie ring on top. Worked great &easy to set up and use on canopy. I was grateful these were on sale and just a little disappointed they only held 20 pounds of sand apiece, but they worked well, had no leaks and with the help of four more bags, managed to hold my EZ up in place in 20 to 30 mile gusts and a horrible rain storm. Good product! Make bigger ones! I can carry 40 pounds! ProsSturdy! I liked the heavy duty Velcro used to wrap around the legs of my EZ Up. They kept the sand dry during a rain storm, which was a plus when I went to load up. ConsWish they made some that held up to 40 pounds instead of 20. Had to use two sets. The weight bags were shipped with my canopy and I was pleasantly surprised with the speed with which I received everything. I thank you for an amazingly swift response to my order. I could not have asked for better service. I was expecting to be able to close the top of the compartment that holds whatever weight you use to anchor the canopy; sand, water, etc., but that is not the case. We ended up putting water bottles in the sleeves. Prosstraps easily with velcro to the legs of any canopy frame. Decent for the price. Consthe compartment for the chosen weight does not close. The bags have a more professional and attractive look than using an orange 5 gallon home depot containers or a bunch of loose weights. Filling them up the first time is a little more difficult but you only need to do it once if you want to store them loaded and ready to go. I really like these bags, they were perfect for the weights I designed to place inside of them. ProsFit perfectly around the legs of my EZ UP canopy,gives a more professional look . ConsOne of my bags was sewn wrong and the weight I designed wouldn't fit. Had to ripe out the thread to make it work. that was the only issue. These are nice little bags. Took a while to get them filled, but after they were, they slide around the legs of our EZ-Up perfectly and did a great job holding it in place in some pretty strong wind. ProsThey fit on the tent legs perfectly and are easy to attach. ConsPretty hard to fill unless you have some sort of special funnel. bought five sets so far. two for my own canopies and three others for other vendors that have seen what they are about. I thought the price was quite a bit for "just" weight bags but man... they are not "just"..I love them! They can be heavy or not so depending on how much sand or what ever you put in them. The selling points are the way they are made. Two tall pockets, a large wrap around Velcro band and a very strong web carrying strap. I comment every time I use them just how well made they are and how good they work. Perfect for ease of carrying and for securing the tent at the craft fair! ProsSO very easy to use, be it to fill them up with sand or to carry. Didn't get these at first, then when we had a windy day and had a hard time keeping the canopy down, I gave them a try. They fit the canopy perfectly, allowing you keep the panels tied to the legs all the way to the ground. Very convenient, and the material is tough - no tearing here. The local markets where I sell require canopies to be tied down. These hold their recommended weight requirements per leg. They look nice, are very durable and have handles for ease in carrying. I also won't have to worry about customers tripping over them. Two bags of pea gravel from the Home center will fill these four heavy, durable bags, and the handles make them easy to carry around. Much more graceful a solution than buckets of cement, and blended nicely with my blackout tent. Minimalistic, effective; a great solution! it can be heavy enough to hold canopy down in quite windy condition. Conswith this bags, it's difficult to zip down the walls.